These unique shapes make great giveaways for dentists, doctors, bank, insurance companies, wedding parties and much more. 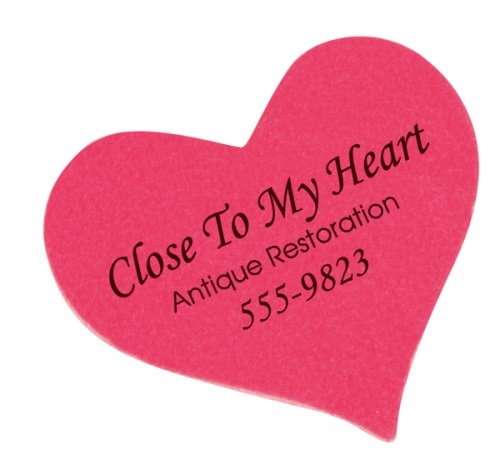 Heart shape emery boards are 2-1/2 x 2-1/4" in size. Prices include straight line typesetting. These emery boards come with a one-color imprint on the front and standard brown sand paper on the back. Choose the color of sand paper for the front: natural (white), tan, yellow, neon pink, neon green, neon yellow, neon orange, pastel pink, pastel blue or pastel lavender. Standard imprint colors are: red, green, blue, black,burgundy and rhodamine red ink (black imprint only on neon, pastel and yellow emery boards).